Finance Costs > How Much Does a Headstone Cost? A headstone, also known as a tombstone or gravestone, is a marker used in a cemetery on top of a burial site. 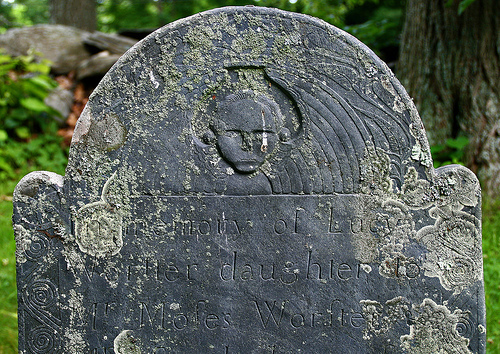 A headstone goes as far back as the 18th century, recognized as one of the oldest forms of cemetery art. A headstone consists of a name, date of birth, the date of death, and can include other information such as a quote or summary of the person’s life. There are also headstones that can provide more than one name. The cost of a headstone is going to all depend on the size of the stone, the design, the material that is going to be used to make it, the number of characters engraved and company creating it. The cost of a headstone will depend on the type you want, where you purchase, the material it’s made from and the design. Most headstones, on average, can be as little as $150 for a simple, flat headstone to as much as $8,000 for something more advanced such as a larger headstone shaped like a heart. A flat, simple headstone made of granite can cost anywhere from $300 to $550, and the price greatly depends on the type of materials being used, the coloring of the stone, as well as the amount of lettering that is going to be placed on the stone. If this flat, simple gravestone were made of a rarer color, then the costs could double or even triple. A pillow top headstone, which stands a few inches off the ground, can cost anywhere from $350 to $2,300. Again, the prices here will depend on the size, the type of materials being used and the amount of lettering on the headstone. An upright headstone, which can stand as high as 36-inches tall, can cost anywhere from $1,000 to $7,500. Generally, the more advanced the design is going to be, the more it is going to cost. For example, a headstone designed like a heart will cost $1,500 to $4,500 more than a square-shaped headstone. Headstones designed as a bench can cost anywhere from $1,000 to $2,900. Troos.com, for example, has hundreds of listings, along with the prices you will more than likely pay for the tombstone. Browse through the pictures and click on the headstones you like to get a ballpark estimate on what it may cost. Refer to our table below to see what the average headstone can cost. A headstone can come in many various shapes and designs, but most of the time, the headstone will be made from granite, often in white, gray, black, blue, red and green colors. Other materials include marble, slate or bronze. Granite will often be the cheapest material, followed by bronze, slate and marble. Turnaround dates can range anywhere from two to six weeks, depending on the complexity and what needs to be included. Some companies may include the engraving, while others may charge anywhere from $40 for a small engraving to as much as a few hundred for a complex engraving. Accessories, such as vases or photos, can be an additional $50 to $150. Other optional items include adding a plaque to the back of a monument, custom artwork, laser etchings or additional finishings. While many companies online will engrave all the necessary information on the headstone, it may be extra depending on what needs to be put on the stone. If the death date has to be engraved in the future, it can cost an extra $100 to $250 extra, depending on the cemetery policy. Due to the weight of these headstones, shipping fees will more than likely apply. Check the company’s shipping policy to learn more. To have the headstone installed in a cemetery, additional fees will apply. Most cemeteries will charge a fee, which is referred to as a foundation or setting fee, can range from $50 to $400 depending on the size of the stone. Taxes may not be included in the quotes seen online. Factor in future costs such as keeping the headstone cleaned or repairs if needed. Before purchasing a headstone, especially if it’s going to be online, always refer to the cemeteries rules before purchasing. All cemeteries will have its own requirements, and if you fail to comply, they may refuse your stone. These requirements may include certain material, sizes and types of headstones. When choosing an online supplier, pay close attention to the hidden fees. While the prices may seem cheaper, this isn’t always the case. Check with headstone manufacturers online. You may find that online manufacturers are going to be cheaper than a local cemetery. While it always is not the case, it is best to get at least three quotes. Veterans of the United States military may be eligible for a free monument marker through the Department of the Veterans Affairs. Purchasing the headstone prior to death can save some money since there is a longer timeline and no rush order. However, the date of death will have to be put on eventually. I want to confirm how much it can cost me to buy that tombstone just like a pillar to put in front with written name, B.O.B and B.O.D only. I want the prices from the cheapest one. I want to buy it from Bulawayo or Lupane in Matebeland North.